4 piece combo from London Ontario who borrow heavily from the early Kinks, Zombies and early Romantics (1st LP) to bring this finely blended mixture of influences to the boiling point on the dance floor. Tunes that’ll get your feet movin’ and put a silly grin on your face as these guys can recreate these tunes live complete with the many harmony vocals that really make the songs. They’ve put the pop and hook, and even little snippets of songs that you know you’ve heard before, but just can’t remember where into the garage punk and made some truly fine songs on this, their debut CD. And this is only a short sampler of the full length and single expected soon. addendum....Still no sign of the full length or the single, but a limited edition cassette was released on Record Store Day and sold on that day only. So if you didn't get a copy, they're all gone! Nashville trio that play fast and furious rock’n’roll based on late 50’s riffs that give these 4 songs a slight rockabilly feel to them. Meant for late night beer bashes, these songs could get just about anyone up and dancing after a few drinks as it’s almost impossible not to like these tunes! This is the first release by the folks at BamaLama Records in Toronto and comes on a goldish/yellow transparent vinyl. addendum...BamaLama Records now has way cool Tshirts of which i'm the proud owner of one. Both of the above reviews were intended for Mongrel Zine #10 but somehow got missed. And you can pick up a copy of Mongrel Zine at Grooves Records here in London. Latest ish has the first part of The Zellots story in it. 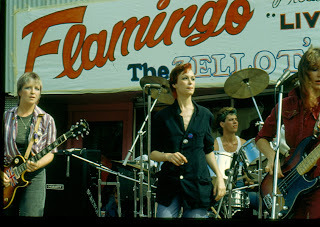 Here's The Zellots playing in front of Flamingos Hair Salon, London Ontario. Aug 1980. Pic from the What Wave archives.